Swedish massage is what many people think of when massage is mentioned. It uses long light strokes, deep kneading, small friction-type motions, light tapping, and movement of the joints. There are many other specialized techniques that you are able to take advantage of during your appointment. Ask your massage therapist about their knowledge of specific techniques that may suit your needs. 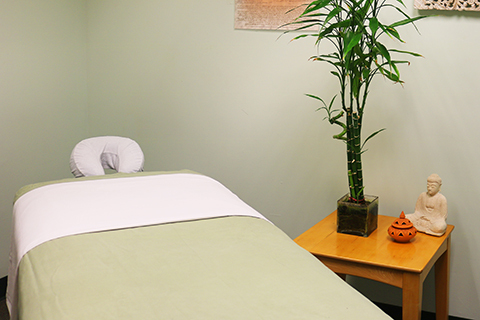 To schedule a table massage appointment, visit or call the sales office at 305-284-5433. The sales office accepts cash, checks, and credit cards (Visa, MC, AMEX). Gift cards are also available and can be used for massage services. Both 25-minute and 50-minute massage appointments are available. Monday and Friday: 10 a.m. - 7 p.m.
Tuesday, Wednesday and Thursday: 10 a.m. - 2 p.m. and 4 p.m. - 7 p.m.
*Buy seven 50-minute table massage passes, and get your eighth 50-minute table massage for free! This offer excludes 25-minute table massages. Special Discounts for UM Faculty and Staff: UM faculty and staff are eligible to receive a 10% discount on a 50-minute massage at the Herbert Wellness Center. The HWC massage therapists have extensive training, as well as many years of experience in several types of massage. In the state of Florida, massage therapists are licensed to further ensure their level of competency and professionalism. Massage therapists have a basic knowledge of anatomy and physiology, and knowledge of when massage is or is not appropriate. Check-In. Please check in at the Wellness Suite desk upon your arrival. We recommend showering prior to your appointment to receive full-treatment benefit. We regret that late arrivals will not receive an extension on their scheduled appointments. Cancellation Policy. We request that guests extend a courteous notice for appointment changes and cancellations. Not canceling or changing appointments 24 business hours in advance will result in being charged the full value of the treatment. No-shows will be charged the full value of the treatments reserved. Rates and Fees. Prices and services are subject to change without notice. Gratuity is greatly appreciated. The Herbert Wellness Center is happy to bring chair massage to University of Miami departments and organizations. Call the Sales Office at 305-284-5433 now to learn more about available times and rates. This services is only available on the Coral Gables campus, and is not available for non-UM affiliated community members.